I always loved that scene at the end of one of the Godfather movies where Michael Corleone assumes the leadership of the family. The dons, one by one, salute him by taking his hand and kissing his ring. I have always had a fantasy of the same thing happening after serving a really good dish. Well, this humble potato dish might do the trick. Normally, we wouldn’t think of peeling and roasting a russet (commonly called an Idaho potato), because it would fall apart. We generally use waxy (low starch, high sugar) potatoes for roasting – as the quote below suggests. And yet, roasting waxy, low starch varieties like red, new, Yukon gold or fingerling potatoes can sometimes produce rocks, with the inside as hard as the outside. “Choosing the right type of potato to cook with can make or break a dish. Potatoes fall into one of two categories — mealy or waxy. Mealy potatoes (russets, purple) have thick skin and a high starch content, but they’re low in moisture and sugar. Waxy potatoes (red, new) are just the opposite. They’re low in starch with a thin skin. They’re high in both moisture and sugar. Mealy potatoes are best for deep-frying. Because they’re low in sugar, they can be fried long enough to cook them fully in the center without burning the outside. They’re also the best choice for mashed potatoes because they fall apart easily when they’re boiled. So, how do we roast a “mealy” potato like a russet. The Brits solved this problem in an interesting way. Basically, after par boiling the potato pieces for a short time, you roughen the edges by shaking them in a colander and then mix them together with flour and rosemary. This gives the potatoes a “new skin” of flour so they won’t fall apart. Hot oil is poured over the flour-crusted potatoes to seal everything in, and they are baked in a high-temperature oven for one hour. The end result is a potato with a very crusty, crunchy exterior and a very soft creamy interior. They are truly great. 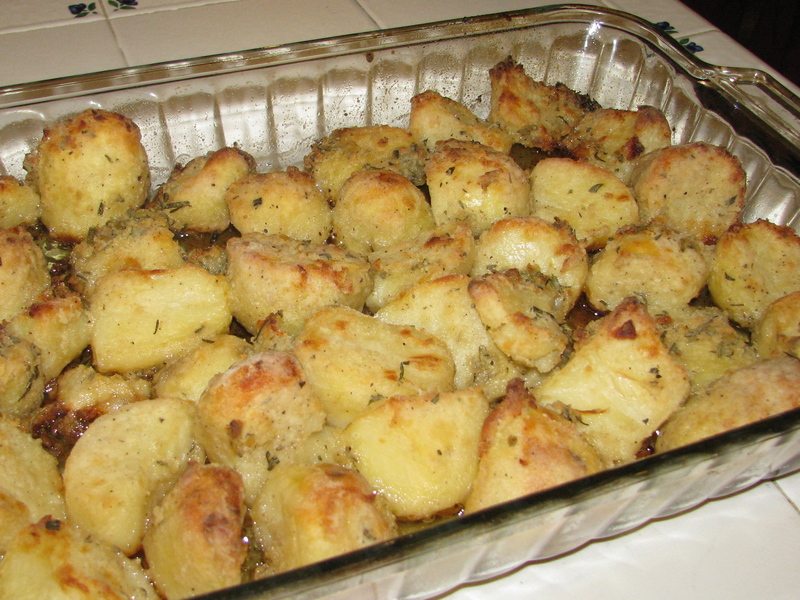 8 medium-sized russet baking potatoes – peeled and cut into cubes about 1-1/2 to 2 inches on a side. Boil the potatoes in salted water (one tbsp) for 10 minutes, and no longer. You don’t them get too soft. Pour the potatoes into a colander and let cool. Put 1/8” of vegetable oil in the bottom of the baking pan and put into the oven to heat for five minutes. Mix together the dry ingredients – flour, rosemary, salt and pepper. Shake the potatoes vigorously in the colander to roughen the outsides. Put the potatoes into a large mixing bowl, add the flour, rosemary, salt and pepper, and mix well. Remove the hot baking pan from the oven and add the potatoes. The potatoes should sizzle a little bit. Tip the pan and spoon the hot oil on top of the potatoes. Return to the oven and roast for one hour. Assuming you did a good job spooning oil on top, you don’t need to stir or turn the potatoes – just leave them alone for sixty minutes. Remove from the oven, cool for five minutes and serve. If you have any left over, have them the next morning for breakfast. Slice them up, put a little butter in a skillet and warm them up over medium heat. These are the best “cottage fries” you will ever taste. You can always add salt at the table and there is no limit to how much rosemary to use – personal taste. I hope they were crusty and crunchy and you had a good pinot noir to accompany the meal.